Yep, you read that right. $133,000 in 14 months. After years in school, student loans can accumulate into the six- figure mark, so after graduation, paying- off student loans tends to be on the top of everyone’s to-do list. As a result, we wanted to give you some insight into how our mentees tackled their student loans. We had the pleasure of meeting them at CSM, heard their incredible personal success story and secrets to how they did it, and wanted to share it with you. After 2.5 years of working in perm jobs and paying of student loans, we realized we owed MORE than we started with. We had considered switching to travel PT in the past, but we never quite had the guts to switch from our perm positions to travel PT. We feared the unknown: leaving a consistent, decent paying job in an area where we were surrounded by friends and family for something that seemed full of variable and unknown. We were afraid we would regret it. Jess cleared up all of our concerns, and then some- I clearly remember Jess saying:“If you want to have more time off, more freedom in settings, to travel, and to pay-off student loans, then travel PT is for you.” We were whispering, “Check! Check! Check!”Jess explained the travel world so well, and she made it go from this farfetched dream or idea to a real, achievable way of working and living. They completely inspired us that travel PT was going to be our next adventure, and we have never looked back since. Now, after traveling for 14 months, we’ve paid off $133,000 in student loan debt! If mentored by to right people, travel will be amazing. Don’t be afraid to step out of your comfort zone. JUST DO IT! 1. Read The Total Money Makeover: Classic Edition: A Proven Plan for Financial Fitness by Dave Ramsey. It’s a great road map by providing strategies to paying off debt. Click image to order it on Amazon. 2. Make a budget using EveryDollar or Minted Apps. 3. Live far below your means. Limit eating-out, unnecessary spending, and prioritize needs vs. wants. 4. Lots and lots of hikes! Since they are free and a great way to see the new city you are in! 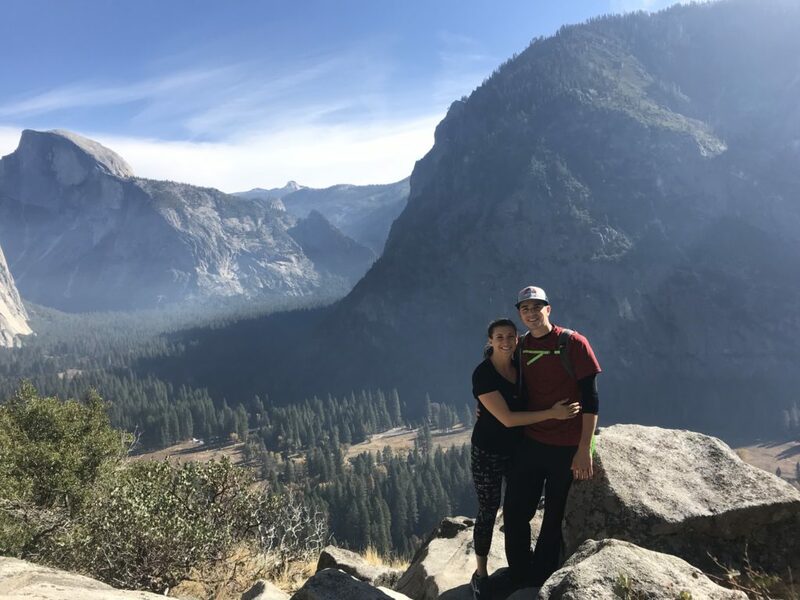 Geena and Garrett are pictured above hiking in Yosemite. 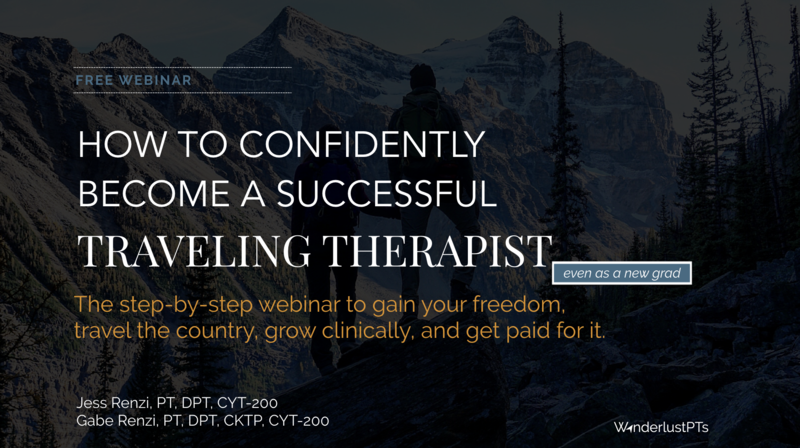 And if you want to become a travel therapist, pay-off student loans, and get travel therapy mentorship too, join us HERE for our next Free Webinar on Traveling Therapy! If this article helped you to feel more prepared about becoming a traveling therapist, please share it with other friends who also may benefit from it. This post contains affiliate links. However, we only recommend products that we truly believe in and use ourselves.